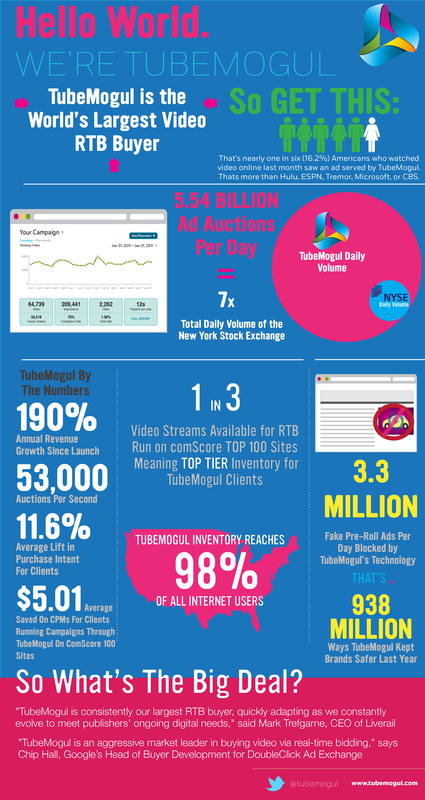 TubeMogul is releasing some statistics today about the success of its video ad buying platform. The big message: When it comes to real-time video ads, TubeMogul is the biggest buyer. As for the claim of being the biggest, it’s not quite as simple as pointing to one chart that puts TubeMogul at the top. Instead, the company is relying on a couple of separate data points to make its argument. For one thing, it includes statements from video ad inventory sellers who call TubeMogul either their biggest or one of their biggest buyers. They range from definitive (“TubeMogul is consistently our largest RTB buyer,” according to LiveRail) to more hedge-y (Google says, “TubeMogul is an aggressive market leader in buying video via real-time bidding.”) The company also points to the recent comScore Video Metrix report stating that TubeMogul’s ads were viewed 537 million times in March, reaching 16 percent of the U.S. population. (That’s higher than Hulu and ESPN, for example.) The company notes that it’s the only one on the list focused entirely on real-time video ad-buying. TubeMogul also says that its revenue has grown more than 190 percent annually over the past three years, and that every automotive and media company in the Fortune 100 has run a campaign on its platform in the past year. Lastly, here’s the obligatory infographic.